A UN plan on the future status of Kosovo has been discussed by the EU foreign ministers in Brussels. 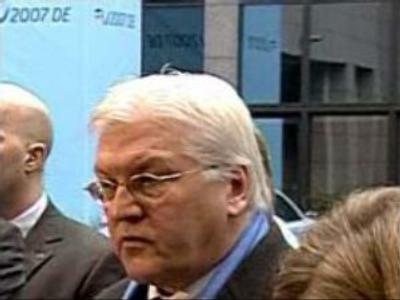 Germany's Foreign Minister, Frank-Walter Steinmeier, has called for more detailed discussions with Russia on the issue. “Since the beginning of the attempts to determine a new legal status for Kosovo, there has been different opinions within the international community because many years ago we founded the international contact group on Kosovo, of which Russia is a member. And we follow Martii Ahtisaari's suggestions and continue to discuss this matter thoroughly with Russia. I am hoping for a solution that would preserve stability in the Balkans,” stressed Mr Steinmeier. The ministers also expressed concern following the deaths of two people in violent clashes between police and ethnic Albanians during protests over the UN proposal. The tension in Serbia's breakaway province is taking its toll. Dozens of activists lit candles for two people who died after being injured in weekend clashes with police in Kosovo's capital Pristina. The two men were among thousands of Albanians who took to the streets to protest against the United Nations plan for Kosovo's status saying it falls short of full independence. The march turned violent when police fired at the crowd with rubber bullets and tear gas. Chief UN envoy, Martti Ahtisaari, unveiled a plan this month calling for internationally supervised self-rule for the breakaway region. It's been backed by Kosovo's ethnic Albanian leaders but rejected by Serbian officials who refuse to give up the province. Russia said it will only support a solution acceptable to both sides. As tensions in Kosovo heightened, its leaders appealed for calm. “I have no doubt the process is going in the right direction and very soon Kosovo will be independent. I call upon all Kosovo's citizens to restrain from any action that could damage, delay or threaten this process,” announced Agim Ceku, Kosovo's Prime Minister. Kosovo has been administered by the UN for almost eight years after NATO bombing lead to change of leadership in the country. Many Western diplomats now fear the recent violence could turn into mass unrest, unless a decision on Kosovo's future comes soon.